Note that water meters and cutoff valves vary by district, but they all follow this basic setup. In general, you are responsible for plumbing on your house’s side of the mater, and the city is responsible for the meter and everything before it. The further north you are located, the deeper the well will be that houses this water cut-off valve. This is because plumbing has to be buried deeper in northern climates to avoid freezing in the winter. You may need a wrench with a long extension to follow the instructions below if you’re in this situation. Your inside water main valve fails and you have a water emergency (burst pipe). You have a leak / burst pipe before the main inside valve (between the street and the inside valve). You are replacing the main water valve. Locate the outside water meter cover. The meter is usually close to the street or alley so that it can be easily read by public works’ employees. If this isn’t an emergency, contact public works in your jurisdiction to ensure they allow owners to operate their cutoff valve. Most districts will allow an owner or licensed plumber to operate the valve as long as they aren’t behind on payments. This particular meter cover has a pentagonal nut holding it down (apparently an attempt to let the average Joe know he shouldn’t be going in here). Remove the nut using the requisite pentagonal wrench. If you don’t have the special wrench, a pair of channel locks will work just fine. Locate the valve inside the chamber and turn the valve clockwise to close it (detail shown in the picture to the right). A pair of channel locks will help you grasp the valve. If the valve at the street has not been operated in a long time, it could be locked up. Whatever you do, DO NOT FORCE THE VALVE. If it will not turn with a reasonable amount of pressure, call a plumber and/or public works. If you attempt to force the valve, it is conceivable that it will break and quickly flood the access point. In order to fix it, the county will have to turn off the water at the next stop, and it could be some time before they get there. You could end up in a situation where you are flooding your neighbors’ basements or your own. So be careful. 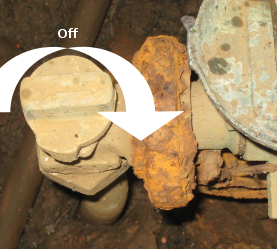 If you find the valve is broken, it is the jurisdiction’s responsibility to replace it (since it sits on the city’s side of the water meter). Never turn on a water meter that has been turned off by the city due to non-payment or for safety reasons. This can be a misdemeanor or felony depending on the circumstances. If you are having trouble paying your utility bills, you should contact the utility/public works and learn your options for obtaining payment assistance. Great post Fred. Around here the water meters are actually located in the house. This is done for several reasons, one is the extreme cold we have would freeze the water meter and valve assembly. We do have shut offs at the street, the valve is actually at least 4′ below grade. There is an extension rod that goes from the valve up to the street. However, around here that shut off is off limits, you must call the local water authorities to have it shut off. If there’s a meter inside is there still a curb side shutoff valve? My shut off valve is flooding at the street level but there is no further damage at this time. Could the shut off valve be broken or something else like a pipe? This leads to a private street. Todd – Good information. I was surprised at the valves around here. While NH gets really cold in the Winter, MD has no shortage of really cold days itself. Most of our plumbing sits below the 36″ freeze depth, however, the meter is only buried about 18″ (the plumbing basically comes up out of the ground and then goes back into the ground), which you can almost see from this picture. does water companies put plates inside the holes outside to keep people from turning water back on? If so how can u remove it? just bought a house that’s been empty for 2 yrs and I’m taking it they stole water. now I can’t get them out here until Monday and I need to check for leaks before they come. I’ve tried my tool however it’s a flat surface which tells me something like a plate is covering the key. I’ve tried a heavy duty magnet also. any suggestions? Sure. In Australia they are found just inside the property. We can trun them on and off as we like. I have turned mine off whenever I need to work on the plumbing. I have to replace the line into my house. The shut off valve has not been turned for 30 years. it is located 12″ down. I removed the access screw cap, inserted the key down the access pipe onto the tongue on the valve but it, as expected would not turn with considerable force. I poured a half cup of WD40 down the 1″ access pipe and let it soak over night. Same results the next day. I gave the key a good wack with a hammer then closed the valve with ease, and no leaks. Great valve to still operate after all this time. Grate stuff, I enjoy doing plumbing at home. Where can I learn to be a licence plumber. I love it. I have so far done everything at home. Love it. Great stuff, I enjoy doing plumbing at home. Where can I learn to be a licence plumber. I love it. I have so far done everything at home. Love it. i have a duplex rental and i need to repair the valve under the bathroom sink. I have done this many times in other duplexes right next door, but when i go out to the street and turn off the main, the water does not turn off. To me this means the city’s valve is broken , i used chanel locks to turn it until it closes or stops. i do not know of another valve in or around the house. Is calling the city my only hope? If you’re sure you’re operating the right valve, then yes, it sounds like the city’s valve is broken and you’ll need to call them to repair it. In our county, replacement of the city’s stop would be the responsibility of the city, and in general, they’re pretty fast at getting someone out (2 weeks), unless its an emergency. So I take it you’ve already looked for a main inside the duplex? Most of the time the city valve is a backstop for another valve inside the house that should be operated first. This is a new housed in NC. The plumbing does not have a shut off valve inside on the water main. The only cut off valve is at the meter outside. Is this in compliance with Code? Jim – I’m not familiar with NC local codes – you could check in your library to see if they’re available there. Very unusual not to have an inside cut off though. May I suggest for you too have your own cut off valve installed. anti tampering laws. Not too mention its a NC Plumbing code too have one. I have a leaking valve before the indoor water meter. I have been struggling with, but finally got the cap off at the street valve. The brass nut was badly damaged probably from past attempts to open cover. The valve is similar to the one pictured, although without the meter and in a very narrow pipe. I don’t have a key, so I cut a slot in a piece of steel 1/2 inch pipe so to fit over the valve. I’ve turned it and the water will not turn off. My question is, is the street valve a screw type valve that requires it to be turned clockwise until tight, or is it a ball type valve that only requires a 1/4 turn to stop the flow. I’ve tried different positions with no success. The valve never felt tight, (closed), so I’m wondering if I am in fact turning the valve at all. The access is so narrow I can’t see much. What are your thoughts on freezing the supply pipe with dry ice to stop the flow. I’ve heard of it but it may be an urban legend. What most people don’t know is there are 2 types of water keys, a meter key as explained, and a gate valve key which has a square 2″ inner diameter socket and is much bigger than a meter key, These are what the city uses to shut down entire streets, large buildings, and repair fire hydrants. Although some meters may have an adapter from t-head to square nut, in this case you would need a valve key to shut off the meter. Valve keys are sold at waterworks and plumbing supply stores but usually not hardware stores. There are also many other security devices and tools I can explain if you have furter questions. Great article! I am trying to do some plumbing work on the inside of my home (replacing valves in the shower/tub) and the main water shut off does not appear to completely shut the water off to the house – there is still a slow stream of water draining from one of the pipes. Should I try the city meter, or is there something else I should try before resorting to that? Laura – city meter is the last resort. You should replace the inside main while you’re at it to put a good one in place. Hey im having water problems. My toilet wont fill up with water. And now my sink is clogged up probably from frozen drainage pipe. I keep running the water though in the sink and everywhere else to keep it from freezing. but im tired of draining out the sink by hand and all. And i will call a plumber once the weather gets warmer. So in the mean time would it be ok to turn the main water off from my shut off valve outside? I know it will freeze and all but will it bust the pipe from under the ground? Edward – hard to say given the fact that it sounds like you have serious plumbing problems. Perhaps the builder did not properly insulate your house? A good question would be whether the main pipe is deep enough under ground. I would like to purchase a water cut off wrench with the following requirements. 1st that the wrench also have the pentigon type of ntut socket built into it. 2nd that the valve shut off portion of the wrench be on a Tee type of rod that is adiquitly long enough to reach down a standard depth hole, say 24″ or better, 36 prefered. hi did you ever find the wrench you was looking for. I’m wanting one myself. so I can work on my house . please if you would let me know what it’s called or where I could purchase one thanks . I need to replace the main water valve in my house so I have to shut off the water at the meter. I will not be asking the city for permission. I have to get this job done soon and can’t wait for them to come out. Any advice? I live in Potomac, MD. and receive water from WSSC. I need to shut off the main valve at my driveway (the internal main gate valve won’t shut off and leaks). The copper main line entering the basement is 1 inch. I’ve removed the brass driveway cap for the main valve. The house is about twenty years old and has the original installation main line and shut off valve. The brass cap is made by Tyler Pipe (Tyler 6500). When I looked down at the valve I was a bit surprised. It’s 18 inches below grade, so far so good; however, my trusty curb key won’t engage the valve tang as the tang is only about 1/4 inch wide by about 7/8 inch. My curb key engages a 1/2 to 5/8 inch wide tang. Is it safe to assume this valve is just a 1 inch ball valve with a smaller than usual actuation tang. I’m afraid to bear down on it until I’m sure what I’m dealing with. Recently our water company installed new lines on the street where I have a summer cottage. Normally, I have used the Curb valve to shut off the water for the winter. However, when they replaced the lines they buried the curb valve down about 5′. I can shut it down for the winter using the house valve in the crawl space under the house, However, there is about 1.5 ft of the service line exposed before the valve. Would heat tape prevent freezing that short length of pipe. We are located in northern Pennsylvania so it gets quite cold for weeks at a time. If anyone can give me some guidance, I would appreciate it. I just recieved a letter form the city of minneap[olis minnesota saying the shut off valve for the water service line to the property does not work. They said it is the owner’s responsibility to keep the shut-off valve and the entire service line in working condition. I am responsible to hire a plumber to fix this. I am barely surving with a huge mortage and awaiting surgery for my leg and I don’t have any money to fix a huge expensive problem. How hard is it to fix myself and how wpuld they know that the shut-off valve isn’t working? I ask this because I have been billed many times for things that were wrong. Thank you for your time. Dear Sir: I was sesnt a letter telling me the city of Minneapolis Minnesota discovered that the shut-off valve for the water line to the property doesn’t work. The letter states that I must fix it according to city ordinance . I am wondering how difficult it is to fix? I also have been billed many times for different charges that were’T correct from the city so my next question is how would they know this? Please let me know as I am waiting surgery for my leg and unable to get around well and have very little money to fix this problem. Thank you for your time. Does anyone know what type of wrench/socket is used in Maine/ southern maine…kennebunk area to turn off the water at the street? is it a special socket? pentagonal or something..maybe with a slot? where wolud i get one. Tthe valve (down 3 or 4 ft below grade), Is ita a ball valve..or a gate valve with a stop. Thanks , Wes… Ogunquit Me. The shut off valve at the street is filled with dirt any suggestions on how to remove it? The valve is around 3-4 feet deep in phila. Roy: Very carefully 🙂 … probably using a hose to moisten the dirt and then a trowel to remove it.. just be careful not to damage the plumbing. I have a city water meter shutoff like the “typical” one shown in this article about shutting water off at the meter. Does it take 1/4 turn, 1/2 turn to shut off or some other fraction of a circle??? Bob, on the one pictured it takes 1/2 turn. I recently purchased a residential duplex (built in 1977). During various inspections, I was amazed to learn that there are NOT separate isolation/gate valves installed within the individual units! In order to perform plumbing service to one side, the water supply must be turned off at the meter! … rendering both units without H2O supply for the duration of the service requirement. YIKES! I was of the understanding that an isolation valve was required by code in virtually all states? The structure is built on a typical foundation with an 24″ crawl space. I have had an inspector examine the crawlspace. He is unable to identify the specific location of where the main supply services entry to the individual units without removing a substantial amount of the floor insulation to “track it down” … very expensive! My question: Does the typical water supply enter (in this type of scenario) somewhere close to the Hot Water tank? … they are opposite of each other on the common wall. If that is the case, then I should be able to remove sheet-rock and install separate gate valves? Apologies for not getting back to you on this one in a quicker fashion. I would say there is not necessarily any correlation between the location of the hot water tank and where the water enters the building…. Unfortunately, water entrance is usually dictated by where the exterior pipes lie, and water heater placement is done based on optimum location within the house from a storage/accessibility standpoint. The code does require separate cut-offs to the best of my knowledge. Might not have been the case when the building was built. Thank you for the simple and quick way to shut off the water at the Main meter…I followed the instructions on our City Water Site and they only had you run a test from the outside main, by the house to see if there was a leak. I did that, but it was still running, so I looked online quickly to make sure the shut off was done correctly…Thank you. now we are waiting for plumbers…any guidelines on good honest plumbers??? Debra, You are most welcome! We really like ServiceMagic.com for finding plumbers and other help. If you’re in a major city, you’ll get return calls in a few minutes – it really is a pretty amazing service. I have a house on the beach that we use on the weekends only. Can I shut off the water meter valve when nobody is living at the house during the weekdays. I had a busted pipe last month with a water consumption of 24000 galons that was repaired now the water company had sent me a statement showing a 35000 galons consumed despite the fact that nobody lived at the house for 3 weeks. what would you suggest and advise me to do????? Fawzi, this is so jurisdiction dependent we just can’t give you a good answer. The general rule is if the leak is on your side of the meter, then it’s your responsibility. You may have some appeals process locally to try and do something about it, but we have seen these types of situations before where the homeowner ends up spending $1,000 on water because they fail to recognize a leak. It really stinks. I have a question, I have water noise in wall behind toilet. Ive been quoted over a grand to fix it. But I was planning on moving anyways. Just not this soon. This house I was renting, and the owner dissapeared. Anyways, Can I turn the water off and on when needed until I move? It is an old house here in Orlando. What do you mean “water noise” – do you mean a leak? If it’s not your house, I wouldn’t spend the money to fix it unless I absolutely had to to make it livable. (That is of course unless your lease agreement says you are responsible for repairs). If the valve at the street is broken, it will need to be replaced, which requires a stop higher up to be turned off. Call the municipality for help on this one. Hi Fred, I live in Orlando, FL. I have a leak from the main line that’s approximately 1′ from the meter. The meter, as u know, is located on a small property between the street & the side walk. I called my public works company, OUC, & they came out to turn off the main valve at the meter. I don’t have any water running to my house at the moment. A friend of mine told me that the public works is responsible for repairing the pipe on that property because it’s considered governmental/city property. Can you advise if this true? whats the name of the key you use to open a valve that is 12″ down…. Last November ,we started having water pressure issue, I started checkingout the lines and valves in house,the last thing was at kitchen sink where pressure lost got to zero. I took it all apart check every thing ,then romoved the fauccete spicket and slowly open valve ,close that side opened other side Hot side. slowly open and closed,somesmall granules ofand stone came out.Put all back together and pressure was restored. then couple days later no water anywherein house. I went out side to front cub and water was streaming down side walk I called the City.They came out shut curb side valveand water stopped Then City man says its yours to fix. I have corp. owned brass stopcocks buried in my front yard. They are the cutoffs for my house and my neighbor’s. I would like to find some sort of plastic well for them for ease of location and access. The valves are angled so that a white PVC pipe is too small. Irrigation valve wells are not deep enough. Any suggestions? We live in world golf village, Fl. If we call the city to come turn the water off to the house would we be charged a fee? Tub faucet needs to be replaced because of a leak. Only shut-off I see is the main meter in the road. Do not have proper equipment or know how to operate. IShut main water val in my house, and the meter was still spinning so wssc said it’s a leak in my yard, I dug from my foundation where I can see the pipes going to my house and clean all the dirt and dug to my property line and turn the waterback on and stilldon’tsee no leakin my yard and shut off val is not in the ground it’sin my wall, there still no leak so could you please tell what’s the problem, because Iam a plumbing labor helper. in typical mobile homes, where would this be located?! by the street or by the house? don’t have a location, and water company cant tell me also, but shouldn’t they know that. I moved into a home may 9th of last year that I rented from an older guy who really seemed to be trustworthy and legit, once I moved in and started to use everything all types of problems begin to occur. Not only that he dropped off the first water bill to me February 11th 2018 and it was kind of high, the next bill he dropped was 5 months later and it was almost $2,000. I didn’t pay for it when he brought it over and I woke up one morning with no running water so I called the water company and asked was my service turned off and they said no and that they haven’t even begun to the process of cutoffs. So I was wondering what happened and it didn’t dawn on me to go and check out the shut off valve,now the one inside the home was fine. So my husband says”you don’t think that he would be as petty as to shut it off himself from the main street valve do you” which I had hoped not. The main valve looks exactly like the one in the photo above, only thing. The meter part in the middle is gone, can you please explain if they can be removed and if so whom do I call to report an illegal shut off as well as how can I turn it back on please because I have 6 children and we need our water. Thank you for your time and help.